Leave a Comment on I’m not crazy; my mother had me tested. Arguably, most forms of art worth lengthy discussion have a bit of madness behind them, whether it is a painting, film, or novel. Personally, I find that my creative work suffers a bit when everything in my life feels completely balanced. Think about the mental states of various actors, painters, and authors. Off of the top of my head, I can come up with Tilda Swinson, Tom Cruise, Charlie Sheen, Hemingway, Tolstoy, Poe, Wolfe, Caravaggio, (cough) Hitler… I could list tons and tons, but I’d much rather hear from you. 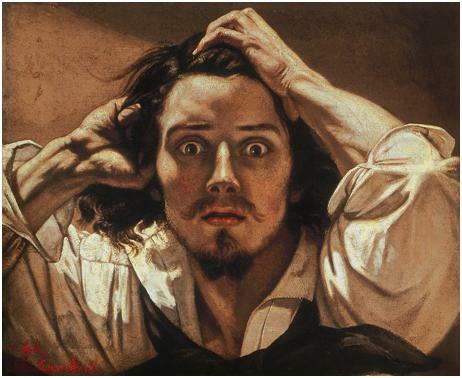 Gustave Courbet, The Desperate Man, 1843-1845. Oil on canvas, 45 x 54 cm. But madness is rather subjective, isn’t it? Some people may be considered mad because they can’t leave a room without flicking the lights three times. Others because they stalk their ex-lovers or call upwards of 232 times without answer. Some because they hear voices in their head. Various others because of their religious affiliations. Beyonce even has a song called “Crazy in Love”. Perhaps we’ve taken the idea of insanity and numbed or dulled it to the point of making it completely undefinable. 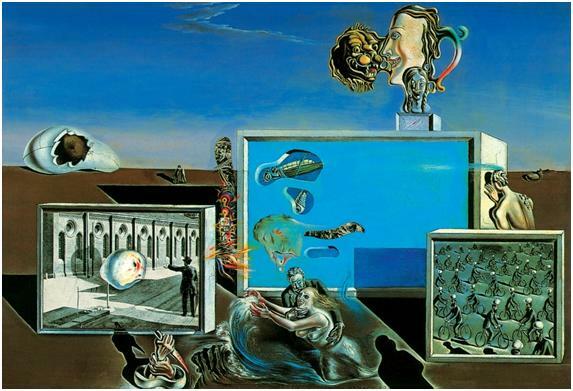 Salvador Dalí, Illuminated Pleasures, 1929. Oil and collage on composition board, 23.8 x 34.7 cm. The Sidney and Harriet Janis Collection, The Museum of Modern Art, New York. The concept of insanity could be discussed and disputed for days on end. Rather than do this and find yourself on the wrong end of a silent treatment, I say check out Borderline Artists between Normality and Madness at the Museo d’Arte della Città through 16 June. Venture as far back as Bosch, who lived in a time before meds, Scientology, and electroshock therapy. Rather than drive yourself insane, use Dali by Victoria Charles, Bosch by Virginia Pitts Rembert, or Van Gogh by Van Gogh – all available on ebook-gallery.com – as inspiration.